Bridge on the River Kwai . . .
Bangkok to the Bridge on the River Kwai by train for 100 baht ($2): Two daily trains link Bangkok's Thonburi station with Kanchanaburi & the Bridge on the River Kwai. See train times here. The third class seats on these trains are not crowded. Vendors sell drinks, fruit, food & beer, it's a very pleasant way to travel. The Bridge on the River Kwai, seen from the Kanchanaburi end. All trains call at River Kwae Bridge station, located about 200 yards before the bridge, a few minutes after leaving Kanchanaburi. The Bridge is now surrounded by cafes, restaurants, souvenir stalls etc. You can walk over the bridge, even though it's still used by 3 trains each way every day. The Bridge On the River Kwai, in the afternoon sun from the Kanchanaburi side. The curved spans are 1943 originals, the 2 straight spans replaced ones damaged by US bombs in 1945. Another view of the Bridge from the Kanchanaburi side. Tourists walking across the Bridge. River Kwai Bridge station is in the far background, just before the bridge. At Hellfire pass you'll find an excellent Australian-sponsored museum. Courtesy of Steve Mason. During World War 2, the Japanese used Allied prisoners of war to build a railway from Thailand to Burma so they could supply their army without the dangers of sending supplies by sea. Many prisoners died under appalling conditions and the line became known as the 'Death Railway'. 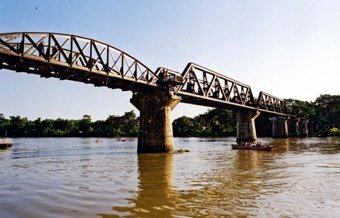 David Lean's famous 1957 film The Bridge on the River Kwai centres around one of the line's main engineering feats, the bridge across the Kwae Yai river just north of Kanchanaburi. Although the film was shot in Sri Lanka, the Bridge on the River Kwai really exists, and still carries regular local passenger trains from Bangkok as far as Nam Tok. For anyone interested in 20th century history, a visit to Kanchanaburi and the infamous Death Railway is a must. This page explains how to travel by train from Bangkok to Kanchanaburi for just 100 baht ($2) and visit the Bridge on the River Kwai, the Wampo Viaduct and Hellfire Pass (Konyu Cutting). You can see the Bridge on the River Kwai as a day trip from Bangkok using the morning train out and afternoon train back, but a 2 or 3 day trip is better as there's more to see than just the Bridge. For example, take the morning train from Bangkok to Kanchanaburi on day 1, stay a night or two in Kanchanaburi, then take the afternoon train back on day 2 or 3, and visit Hellfire Pass (less well known than the Bridge, but not be missed) and ride the Death Railway over the dramatic Wampo Viaduct as far as its current terminus at Nam Tok. From Bangkok: There's something not right about taking a bus to see the Death Railway and Bridge on the River Kwai. 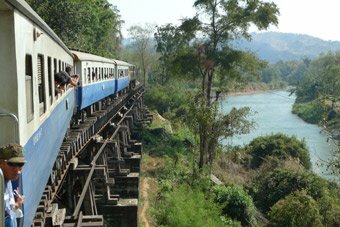 It's more appropriate - and much more fun - to take the train from Bangkok to Kanchanaburi and the Bridge on the River Kwai using the Death Railway itself. Two trains a day leave Bangkok Thonburi station (also known as Bangkok Noi) on the West side of the river in Bangkok, for Kanchanaburi then River Kwai Bridge station (on the Bangkok side of the Bridge a few minutes beyond Kanchanaburi), then crossing the Bridge itself & running alongside the scenic River Kwae over the Wampo Viaduct to Nam Tok. The fare is only 100 baht (£2 or $3). No reservation is necessary, they cannot sell out, just turn up, buy a ticket and hop on any time before it leaves. The trains are 3rd class only, but don't let this put you off as they are clean & comfortable, see the photo above right. In fact, sitting next to an open window whilst clickety-clacking through the Thai countryside is easily the most pleasant way to reach Kanchanaburi. There's no buffet car, but vendors walk up and down the train selling soft drinks and pre-packed fruit and food. The slices of Pomelo are lovely, not too sweet and not too sour. At weekends there's also a tourist day excursion train. From Singapore, Malaysia or Southern Thailand: You can travel to Kanchanaburi & the River Kwai Bridge without going all the way into Bangkok and out again. Express trains from Penang, Hat Yai, Surat Thani & Hua Hin all stop at Nakhon Pathom, 64 km southwest of Bangkok, where you can change onto the local trains to Kanchanaburi (the actual junction between the Death Railway and the Bangkok-Singapore main line is at Nong Pladuk, but express trains don't stop there). 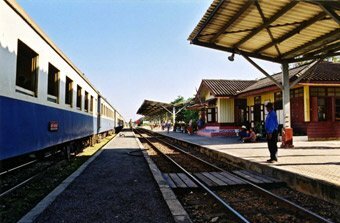 See the Malaysia page for train times between Singapore, Kuala Lumpur, Penang & Nakon Pathom or the Thailand page for trains from Hat Yai, Surat Thani & Hua Hin to Nakon Pathom. Just remember the trains from the South can be 20 to 40 minutes late or more, so don't plan any tight connections. Map of train routes in Southeast Asia. The Wampo (Wang Po) Viaduct is between Thamkrasae Bridge & Wang Po. Tourist coach attached River Kwae - Nam Tok, 300 baht: For 300 baht you can travel in a special foreign tourist car attached to train 257/258 between River Kwae Bridge and Nam Tok. Billed as the Trans-River Kwai Death Railway it's exactly the same as the regular 100 baht cars, but you get a seat cushion, small boxed snack, water and a certificate. You buy tickets from a special booth at the opposite end of the platform from the regular ticket office, next to the Tourist Police booth. Operated by Train Travel Tour Co Ltd, a subsidiary of the State Railways of Thailand. 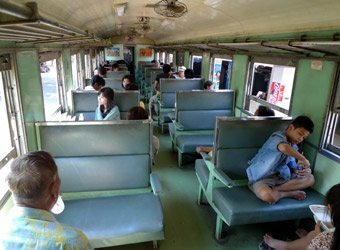 Weekend excursion train: On Saturdays, Sundays & holidays there's also an excursion railcar from Bangkok to River Kwai Bridge, Nam Tok & Kanchanaburi, see the details here. Bangkok to Kanchanaburi 100 baht (£2, $3) each way. Bangkok to Nam Tok 100 baht (£2, $3) each way. Kanchanaburi to Nam Tok 100 baht (£2, $3) each way. No reservation is necessary, just turn up & buy a ticket. There's one other way to visit the Bridge on the River Kwai, and it's the luxury option. The superb Eastern & Oriental Express cruise train links Singapore with Bangkok up to 3 times each month, and it makes a detour to the Bridge on the River Kwai on the way, with time to get off and visit the bridge. A Singapore-Bangkok journey costs upwards of £1,775 per person for 3 days, 2 nights, all meals & afternoon tea. For this luxury option, see www.belmond.com/eastern-and-oriental-express or browse inclusive tours incorporating this train at www.railbookers.co.uk. Kanchanaburi - this is the area's main town, with Allied war cemeteries. Most hotels are located here. 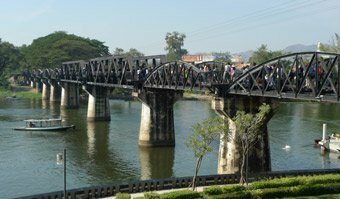 The Bridge On the River Kwai - the Bridge is 5 km beyond central Kanchanaburi, and is now surrounded by cafes, shops and small museums. You can walk over the Bridge (watch out for trains!) or cross it by train when travelling between Kanchanaburi & Nam Tok. The Bridge has its own station, River Kwae Bridge station is about 200 yards before the Bridge at the Bangkok end. Wampo viaduct (Wang Po) - also built by prisoners of war, and also still in use by regular passenger trains. The best way to see it is to take a train from Kanchanaburi or River Kwae Bridge station to Nam Tok. 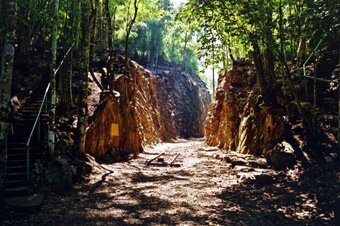 Hellfire Pass (Konyu Cutting) - Beyond Nam Tok, the line onwards to the Three Pagodas Pass into Burma is closed and the track lifted. 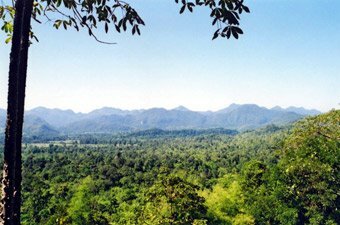 80 km (50 miles) beyond Kanchanaburi (approximately 10km or 6 miles beyond Nam Tok) is Konyu Cutting, dubbed Hellfire Pass by Allied prisoners. Here there is a museum, and a 7 km stretch of the trackbed beyond Konyu Cutting has been cleared of jungle by the Australian government as a memorial, of which 4 km is currently open to the public. You can walk this 4 km section if you like, a moving and highly-recommended experience. The Death Railway starts at Nong Pladuk, a junction on the Bangkok to Singapore main line some 80km west of Bangkok. The line heads northwest to Kanchanaburi, over the Bridge on the River Kwai, along the Kwae Noi ('Little Kwai') and over the Wampo Viaduct to Nam Tok, the current terminus for passenger trains. From Nam Tok, the disused track bed heads on to Konyu Cutting ('Hellfire Pass') and through the Three Pagodas Pass into Burma (Myanmar) and onwards to Moulmein. The Japanese used Thai forced labour to construct the section from Nong Pla Duk to Kanchanaburi, and Allied prisoners of war for the section from Kanchanaburi onwards to Burma. The line was completed in 1943, and like all the railways in Burma and Thailand, it was built to the metre gauge, much narrower than European standard gauge. Passenger trains still run from Bangkok to Nam Tok, but the section from Nam Tok to Moulmein is disused and the track has been lifted. Bridge on the River Kwai... Or is it? There is a slight technical problem with the Bridge on the River Kwai: It crosses a river all right, but not the River Kwai. Pierre Boulle, who wrote the original book, had never been there. 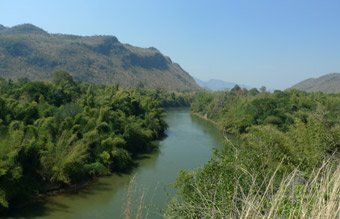 He knew that the 'death railway' ran parallel to the River Kwae for many miles, and assumed that it was the Kwae which it crossed just North of Kanchanaburi. He was wrong - It actually crosses the Mae Khlung. When David Lean's blockbuster came out, this gave the Thais something of a problem. 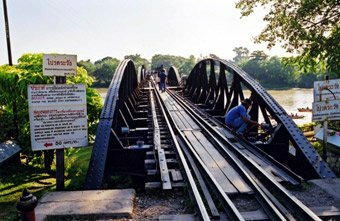 Thousands of tourists flocked to see the Bridge on the River Kwai, and they hadn't got one, all they had was a bridge over the Mae Khlung. So, with admirable lateral thinking, they renamed the river. Since 1960, the Mae Khlung has been known as the Kwae Yai ('Big Kwae') north of the confluence with the Kwae Noi ('Little Kwae'), including the bit under the infamous Bridge. The Bridge on the River Kwai is about 5 km from the centre of Kanchanaburi. By all means wait for one of the three daily passenger trains, all of which call at the River Kwae Bridge station, but it's best to take a cycle rickshaw. 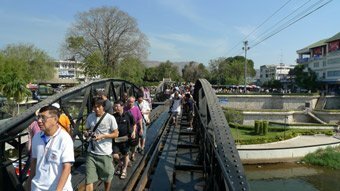 The Bridge is now surrounded on the Kanchanaburi side by a museum, cafes, shops and a couple of steam locomotives on static display. You're free to walk across the bridge on the wooden planks, but remember to stand aside for the passenger trains when one comes along. If this sounds foolhardy, remember that there is a 10 km/h speed restriction for trains across the bridge, and they all hoot like mad. There were actually two bridges here, both built by prisoners of war - The first (wooden) bridge was completed in February 1943, superseded a few months later by the steel bridge which you see today. The curved steel bridge spans are original, and were brought from Java by the Japanese. However, the two straight-sided spans come from Japan, and were installed after the war to replace spans destroyed by allied bombing in 1945. Make sure you ride the train between Kanchanaburi (or River Kwae Bridge station) and the current terminus of the operational railway at Nam Tok. As well as crossing the famous Bridge on the River Kwai, the train runs along the beautifully scenic River Kwae, passing at slow speed over the impressive Wampo Viaduct (sometimes written Wang Po), also built by prisoners of war. The viaduct consists of wooden trestles alongside the river, nestling against the cliff side. Another must-see is Hellfire Pass, or to give it its proper name, Konyu Cutting. This is located about 80 km (50 miles) north of Kanchanaburi, on the disused section of line beyond Nam Tok. Here, the Australian government has cleared about 7km of the old track-bed as a memorial to the 13,000 allied prisoners and 80,000 Asian labourers who died building the railway - though only 4 km is currently open to the public. The site includes the Hellfire Pass itself (Konyu Cutting, dubbed 'Hellfire Pass' by the PoWs for the way the worksite looked at night by torchlight, and pictured right). A taxi and driver for half-day from Kanchanaburi will cost about £35, and you can ask the driver to drop you at Nam Tok on the way back, to return to Kanchanaburi or Bangkok by the 12:55 or 15:15 train. 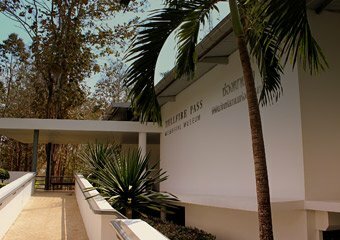 There are one-day organised tours from Kanchanaburi, but these typically get only 30 minutes at Hellfire Pass, only enough to see the pass itself. If you go independently, you can walk past the locations of 'Three Tier Bridge' & the 'Pack of Cards' bridge several km northwest of the visitor centre. The peaceful walk through the warm shady jungle along the disused track-bed, past small cuttings and dips where the wooden viaducts used to be, is a very moving experience. You could spend weeks exploring this beautiful area, but most people have limited time so here are idea on how to incorporate Kanchanaburi & the Bridge on the River Kwai into your trip to Thailand. As a day trip from Bangkok, using the daily local trains... If all you can spare is one day, you can see the infamous Bridge on the River Kwai as a day trip out of Bangkok for just 200 baht (£4 or $6), using the 07:45 passenger train from Bangkok (Thonburi station) to River Kwae Bridge station and returning on the afternoon train. The trains run daily, with enough time to see and walk across the Bridge, and perhaps take a cycle rickshaw to the war graveyard in central Kanchanaburi and boarding your return train there. See the timetable below. You won't get to see Hellfire pass this way, or travel along the Kwai Bridge to Nam Tok section of line, although you could choose to travel Bangkok-Nam Tok and back instead of spending time at Kanchanaburi. That way you'd cross the Bridge on board a train, and see the line & scenery all the way to Nam Tok. 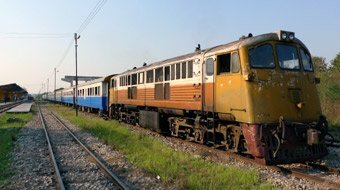 As a day trip from Bangkok, using the weekend railcar excursion train... On Saturdays, Sundays & Thai national holidays, there's a tourist railcar excursion train from Bangkok's main Hualamphong station, costing just 120 baht. It allows time for you to see and walk across the Bridge, then travel across the Bridge by train and along the scenic line via the Wampo Viaduct to Nam Tok before returning to Bangkok with a visit to the Kanchanaburi war graveyard on the way. A good option if you've only a day to spare and can arrange to go on a Saturday or Sunday. Tourist railcar information, fares & timetable. Though you won't get to see Hellfire pass on this trip. As a day trip, using the weekend railcar to River Kwae Bridge then scheduled trains to Nam Tok & back to Bangkok. On Saturdays, Sundays or public holidays, you could take the 06:30 railcar excursion train (120 baht) from Bangkok's main Hualamphong station as far as River Kwae Bridge, spend an hour there and pick up the following daily local train from Bangkok to Nam Tok (show your excursion train ticket), returning on the same local train back to Bangkok (100 baht). This gets you some time at River Kwae Bridge, and gets you to Nam Tok over the Wampo Viaduct, but returns you to Bangkok a couple of hours earlier than using the railcar for the round trip. Tourist railcar information, fares & timetable. Regular train timetable. 2-day trip from Bangkok... The area really warrants at least a 2-day trip, so you can get to Hellfire Pass as well as Kanchanaburi. On day 1, catch the 07:45 train from Bangkok (Thonburi station) to Kanchanaburi for 100 baht (£2 or $3), find your hotel and order a taxi to Hellfire Pass (about £35 or $45 hire for a half day). On the return journey from Hellfire Pass, get the taxi to drop you at Nam Tok station in time for the 15:15 passenger train along the scenic Kwae Noi river, over the Wampo Viaduct and across the Bridge back to Kanchanaburi. Day 2, explore Kanchanaburi & the Bridge area, then take the lunchtime train back to Bangkok. See the train timetable below. 3-day trip from Bangkok... Less rushed than the 2-day version! On day 1, you could catch the 07:45 or 13:45 train from Bangkok (Thonburi station) to Kanchanaburi for 100 baht. Day 2, take a taxi to Hellfire pass (£35 or $45 for half day hire), then on the return get the taxi to drop you at Nam Tok station and take the afternoon passenger train along the scenic Kwae Noi river, along the Wampo Viaduct and over the Bridge back to Kanchanaburi. Day 3, take the morning or lunchtime train back to Bangkok. See the train timetable below. The late afternoon local train to Nam Tok crosses the Bridge on the River Kwai. Photo courtesy of Steve Mason. To learn more about the history of the Burma-Siam Death Railway and the Bridge on the River Kwai, 'River Kwai Railway' by Clifford Kinvig is highly recommended. If you haven't read it already, Eric Lomax's The Railway Man is amazing, the true story of his experience on the Death Railway and his reconciliation with the Japanese interpreter who tortured him. It's now a major film with Colin Firth and Nicole Kidman, but although the film is excellent I'd say it struggles to achieve the same power as Eric Lomax's book. 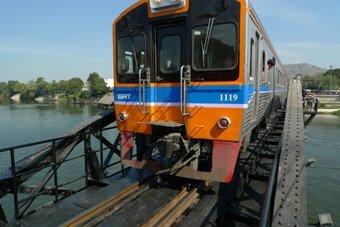 Bangkok to the Bridge on the River Kwai by train: Two daily trains link Bangkok's Thonburi station with Kanchanaburi & the Bridge on the River Kwai. See train times here. 06.30 depart Bangkok Hualamphong station, Saturdays & Sundays only. 07:40 arrive Nakhon Pathom, 40 minute stop to visit the great Chedi (cone-shaped temple). 09.26 arrive Kanchanaburi, 3 minute stop. 09.35 arrive River Kwai Bridge station & stop for 25 minutes. 10.00 depart River Kwai Bridge station, cross the Bridge & head along the River Kwae via the impressive Wampo Viaduct. 11.30 arrive Nam Tok station. 11:30 arrive Nam Tok Sai Yok Noi. This is the only train to run beyond Nam Tok to the end of the operational line. Time to see the scenic waterfall. 14:25 leave Nam Tok Sai Yok Noi. 14.25 leave Nam Tok station heading back south. 15.53 arrive at Kanchanaburi station and stop for 60 minutes for a visit to the war graves. 19.25 arrive back in Bangkok Hualamphong station. How much does it cost? The round trip fare is 120 baht 3rd class non-air-con or 240 baht 2nd class air-conditioned. How to buy tickets... Advance reservation is required for this excursion train and you should book tickets in person at the station as far ahead as you can - it cannot be booked online. This train can sell out even though it has hundreds of seats. However, it's reported that if necessary you can just get on and pay the conductor on the train - you'll usually find plenty of free seats between Bangkok, Kanchanaburi & River Kwae Bridge, with all seats fully-booked by tour groups from River Kwae across the bridge to Nam Tok, so if necessary you'll have to stand for this section if you didn't get a reservation. For information, see the Thai Railways website www.railway.co.th, click the UK flag for English, click Travel by Railway and look for the Nam Tok Saiyoknoi Waterfall trip. If you've limited time, this might be a good option, though you won't get to see Hellfire Pass & its museum. You should take a good guidebook. Easily the best guidebooks for independent travel are the Lonely Planets and Rough Guides. Both have stacks of practical information plus historical and cultural background. You won't regret buying one of these guides!